If you’re after smooth, youthful, healthy skin (and which of us isn’t? ), antioxidants could be the secret weapon you’ve been looking for. Recent research shows that these nutrients and enzymes play a significant role in the prevention and repair of damage caused to the skin by age, metabolic changes, environmental factors, or stress. Think about how a peeled apple, banana, or avocado turns brown when exposed to the air: that happens because of oxidation, a damaging process that can lead to cell dysfunction. In the case of your skin, oxidation at a cellular level is caused by free radicals emitted when your body breaks down food or absorbed when you’re exposed to harmful irritants like cigarette smoke, pollution, or too much sun. As we get older, our skin naturally loses elasticity and becomes thinner, a process which is accelerated by the activity of free radicals. Antioxidants work by neutralising the harmful free radicals thus reducing oxidative stress and repairing or preventing visible (and hidden) signs of damage. Antioxidants occur naturally in many foods (such as colourful fruits and vegetables, nuts, and grains), and are increasingly available in supplement form and added to skincare products too. Elastin and Collagen are the substances that maintain the skin’s elasticity and strength, keeping it looking supple and young, but free radicals specifically break down these proteins in the body, accelerating the natural effects of ageing. Antioxidants help neutralise this damage and renew collagen and elastin production, firming the skin and rejuvenating its appearance. By stimulating blood flow in the skin and encouraging the growth of new cells, antioxidants can also be effective in the treatment of sun damage, including age spots; the treatment of acne; and in minimising the appearance of scars. One of the main benefits of antioxidants is their anti-inflammatory effect. Inflammation is a major cause of many skin issues, from acne to rosacea to eczema, while chronic inflammation plays a key role in skin ageing. Antioxidants counter inflammation by increasing circulation and cell metabolism, resulting in an evener skin tone and an improvement in the appearance of wrinkles and fine lines. 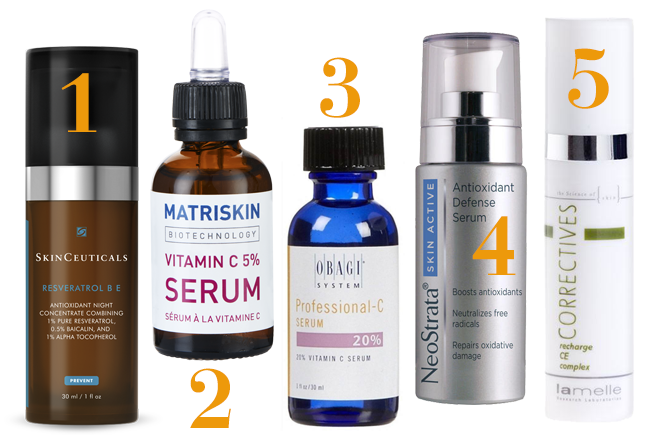 Retinol is one of the best-known and most effective antioxidants. It has been shown to increase collagen production and raise levels of glycosaminoglycan, which is an important skin-protecting substance, resulting in firmer younger-looking skin with an improved texture. Retinol helps in the creation of new skin cells, and also has powerful anti-inflammatory effects. Vitamin E (often listed in skincare product ingredients as tocopherol or tocotrienols) works to protect cell membranes from oxidative and ultraviolet light damage; it’s particularly effective when used in conjunction with vitamin C (listed as ascorbic acid or tetrahexyldecyl ascorbate) to treat wrinkles, brown spots, and skin dullness. Vitamin C increases collagen production, enhances the skin’s repair process, strengthens its barrier response, reduces inflammation, and helps skin withstand exposure to sunlight. Resveratrol, a powerful antioxidant found in red grapes, red wine, nuts, and fruit like blueberries and cranberries, also protects against sun damage, reduces cell damage, and improves collagen production at the same time as having significant anti-inflammatory benefits. Other antioxidants believed to be good for your skin include EGCG extract, which comes from green tea; coffee berry (which has nothing to do with the coffee you drink! ); selenium; lycopene, occurring naturally in red fruits and vegetables; grape seed extract; coenzyme Q10; and niacinamide (vitamin B3). 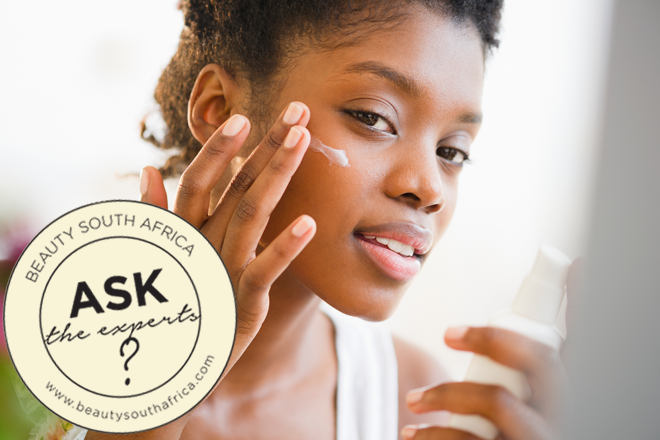 So what should you be looking for in a skincare product? According to our experts at Skin Renewal, a combination of several different antioxidants generally has the best results. Serums, which are deeply absorbed into all the layers of your skin, are a particularly good way of maximising the benefits of antioxidants; if you have a normal or dry skin you might want to add another moisturiser as well after the serum has sunk in. Apply serum at least twice a day, and before an application of a sun-protection product. It’s important to remember that antioxidants, to remain stable and to be effective, need to be in the correct forms and in concentrations that are neither too strong or not strong enough; experts recommend that you experiment cautiously to find the product that suits you best. If you’re in any doubt, ask the advice of your dermatologist. Vitamin E is a big part of my skin care routine.